Baptist minister and Republican Presidential hopeful Mike Huckabee seems to either struggle with the truth or has a penchant for exaggeration, Arkansas-style. That's not the first time Huck has made such a claim. Apparently, Huck is a seminary drop-out. He spent a year at Southwestern Baptist Theological Seminary in Fort Worth before dropping out to work for the televangelist James Robison. Governor Huckabee doesn't have a theology degree. He only spent a year in seminary. Back in 2001, the guy in the picture above, former Georgia Tech football coach George O'Leary was hired to coach the Notre Dame Fighting Irish. Five days after accepting the job, O'Leary resigned after he was discovered to have lied on his resume. On the resume, O'Leary claimed that he had earned a master's degree from New York University when in fact he only attended the school but never graduated. Well, Mike Huckabee obviously isn't dropping out of the Presidential race for his theology degree fib. Nor should he. But I guess Huck is quite familiar with the old preacher joke - "Don't mind my facts, I'm just preachin." And of course we know politicians struggle with the complete truth regularly. Nonetheless, it seems that Huckabee has received a complete pass from the media on his little fib. First, this story is about a week late. The thing you left out is that he has a B.A. in Religion from Ouachita Baptist University, a Baptist school in AR. I have a degree in Religion as well and I too have referred to it as a degree in theology (which is essentially what it is). “I have a bachelor of arts in religion and a minor in communications in my undergraduate work. And then I have 46 hours on a master’s degree at Southwestern Theology Seminary. So, my degree as a theological degree is at the college level and then 46 hours toward a masters — three years of study of New Testament Greek, and then the rest of it, all in Seminary was theological studies, but my degree was actually in religion. I don't think he was intentionally trying to deceive, but rather pointing out his educational background did indeed involve theology. Now, if he'd said he had a Master's degree in theology, then I would say that people should be up in arms. But really this is a non-issue and certainly not comparable to George O'Leary. As for anyone at National Review taking him "to task", I would note that they have been trying to do hit jobs on him ever since he started his rise in the polls. The real problem here is that people have stopped listening to what the candidates have to say and have started playing "GOTCHA" instead. I wonder if Bill Clinton would have survived this kind of election (it sure looks like his wife is struggling with it these days). Oh, and btw, 46 hours is a masters and a half in any other discipline than theological studies. And it's about half of the 90 hours needed for a M.Div. I too have a degree in Religion (and Poli Sci) from the University of Georgia. Its not a theology degree. And I'm not sure I'd describe a Religion or Christianity degree from Baptist schools such as Baylor, Mercer or Brewton-Parker College (the three I'm very familiar with) as the equivalent of a theology degree. Does the Religion degree equal a theology degree or is Huck claiming that Ouachita plus 46 hours of MDiv work the equivalent of a theology degree? Rudy could make such a claim. According to several articles I've read, Rudy studied theology in college for 4 years. He doesn't make the theology degree claim though. Huck could have said he "studied theology" instead of making the degree claim and he'd have been telling the complete truth. I waited a week to see how this would play out. From listening to Huckabee, he always gave the impression that he had a degree from SWBTS. I was surprised to see that he never completed seminary. I think this boils down to point of view and (mis)understanding of his education. While you have a religion degree and don't consider it to be about theology, I would guess that you also didn't take classes in Greek, Hebrew, and exegesis. But in conservative schools, that is exactly what happens (especially when Huckabee was getting his education). I had 2 full years of Greek before I went to seminary and now (at Union U. ), you also have to take classes in Christian theology, exegesis, and ministry. There is basically no difference in a Religion degree from a conservative school and a Seminary degree. So much so, that Southern Seminary offers an Advanced M.Div for students coming from college religious departments, just so they don't take those classes twice. But I think you're missing the point that this has been blown up beyond the need. 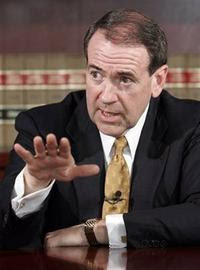 It's simply another hit job - trying to find a way to attack Huckabee on something other than the issues. Or a way to chip away at his integrity - something he seems to have more of than anyone else in the current field (both conservative and liberal). As for your statement, "From listening to Huckabee, he always gave the impression that he had a degree from SWBTS," I'd like to know what he said that made that not a misunderstanding on your part, but rather an intentional attempt on his to mislead. If you go in with that presupposition, then you can justify your belief. I just don't think it's justified from a neutral point of view. Just a thought, if Hackabee applied for a secular job in management and his employer looked at his major and transcript how would he or she interpret his degree? I would suggest that he or she would see it as a degree in theology or religion as you suggest. Are we trying to split hairs here. Is Rudy G.'s degree in religion? I personally believe the comparison to George O'Leary is unfair. Whether or not Huckabee should be our next president is for the voters to decide, but we should be careful about implying that he is loose with the truth. I appears I called Huckabee--Hackabee in my earlier comment. I don't know what Freud would say about that, but it may have more to do with my typing and editing skills than my subconscious. At least I hope so! For those who may be interested, we have an interesting, "live" conversation going on about this topic right now at thinklings.org. I'm with Big Daddy on this one: I think it's a problem. I've noted further developments on my blog, http://levellers.wordpress.com/. But, watching the news tonight, it seems that this may not be a problem unique to Huckabee. "Resume inflation" seems to be a problem in other campaigns: Mitt Romney's claim that he "saw his father march with Dr. King" is false. It never happened. George Romney was a pro-civil rights Republican and did go to King's funeral and marched in some civil rights demonstrations, but never one in which King was present. Romney's other claims about being a lifelong hunter or having NRA endorsement also turn out to be, at least, exaggerations. In the wake of an administration whose reputation for dishonesty far outstrips anything Bill Clinton was ever guilty of, do Republican hopefuls like Romney, or ministers like Huckabee, really want to repeat the mistakes of Al Gore? No resume inflation. Just give us straight talk.